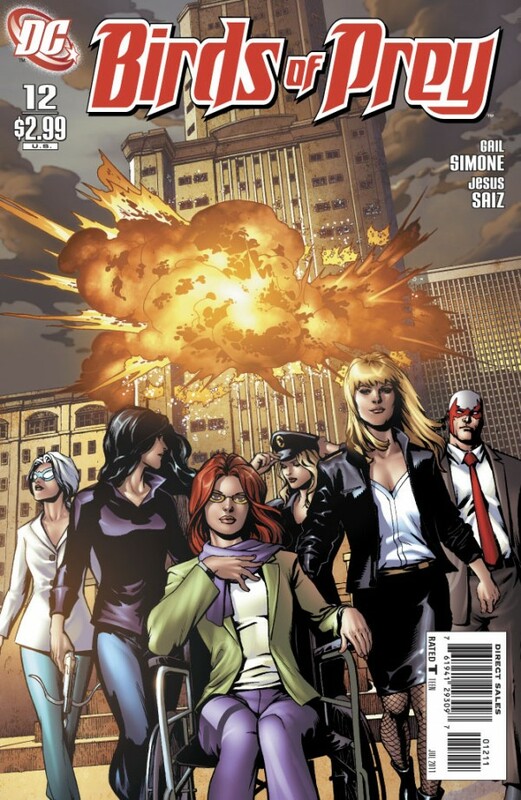 Birds of Prey #12 – Gail Simone continues to effortlessly impress me, as this latest issue of Birds of Prey finds the ladies come face-to-face with a villain from Simone’s Secret Six. I always love when a writer cross-references work from other titles to provide a sense of continuity, assuming it’s done well, and Simone has no problem incorporating one of her own creations here. I’m eager to see how the Birds will handle the threat—after all, this group is far from being anything like the Six, and it’s a pretty ridiculous villain we’re talking about. A few refreshing elements to this issue: Zinda taking a more upfront role in the team’s current mission; Helena attempting to recruit and subsequently teaming up with The Question; and Hawk & Dove in the backseat of the story so far—the less of them, the better as far as I’m concerned. I like this book to concentrate on its core members—Babs, Dinah, Helena, and Zinda. Spotlight guests are welcome, but let’s keep them that way. When it’s just those four, the story seems to flow better, the quips come easier, and the tone throws it back to the good old days of the Birds book. Jesus Saiz comes on board for art duties here—I feel like I haven’t seen enough to really judge if I like him or not, but his stuff IS good. I’m not sure why Birds of Prey has been given the finger as far as not having a steady artist—a book as stellar as this month after month should have some priority and artistic consistency—but hopefully things change now with Saiz in the hot seat. 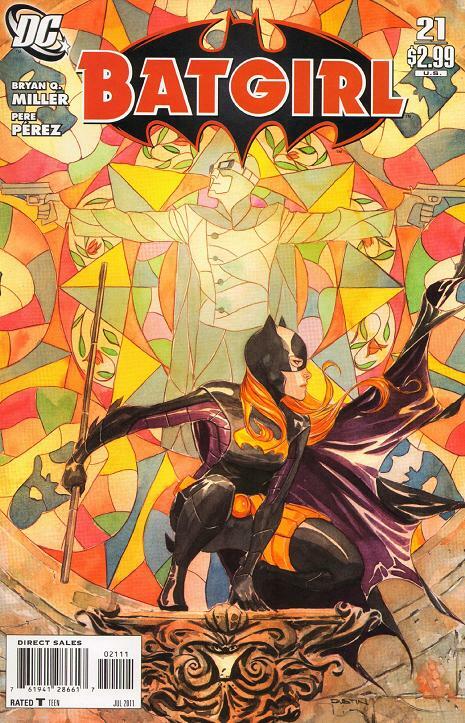 Batgirl #21 – As much as I love Birds of Prey, these days I think I’m never happier than when I’m reading Batgirl. I love this book SO MUCH. I love Stephanie Brown, I love Bryan Q. Miller’s writing, I love the unapologetic humor, the fantastic artwork by Dustin Nguyen, the overall happy-go-lucky, FUN tone of this book. How I went so long before this title without Stephanie Brown in my life is a mystery to me, and the awesomeness that makes Batgirl what it is just continues to flourish with each story arc. Issue #21 continues Stephanie’s fight against The Order of the Scythe as she engages their newest member, Harmony. Not only does she have to deal with new foes, however; she’s also losing some allies. With Barbara stepping away from her Oracle persona, Proxy also breaking the news that she’s heading out on her own search for self-discovery, and the Grey Goose “betraying” Steph (though unbeknownst to her and, frankly, probably welcome), they’re dropping like flies. I love Bryan Q. Miller using the Goose’s obnoxious persona as a mirror to how Steph herself began as the arguably annoying Spoiler—it works hilariously well. What DOESN’T work well is what I propose to be this sense of urgency Miller has tried to build up over Proxy and her decision to leave team Batgirl. I don’t know enough about Proxy to really care or empathize; quite frankly, I’m kind of excited to see her go. Let’s focus this back on Batgirl and let her awesomeness shine on its own. It’s what got me into this book, and it’s what will keep me here. Amazing Spider-Man #661 – I don’t read any Spider-Man titles on a regular basis; rather, I pick them up here and there when something catches my eye or sounds interesting. I wasn’t planning on reading this issue until my ever-hilarious friend and sometimes co-worker Dario urged me to check it out. I’m so, so glad he did, because this issue was … um, “Amazing.” Christos Gage temporarily takes over the writing duties, and he does a damn fine job—I was laughing out loud on almost every page as Spider-Man attempted to substitute teach Hank Pym’s problem children. Sampling the work here has made me want to check out his Avengers Academy; I’ll definitely be going back and picking up the first trade now. You know when you get into a stretch where you just seem to pick up bad issue after bad issue after bad issue of titles, and you get to a point where you’re like “Geez, do good writers EXIST anymore, or is it all just a world of Judd Winicks and Matt Fractions”? Then you pick up a Mike Carey or a Gail Simone and it’s THEN that you remember why you read comics in the first place. Your faith in the medium is restored. This is what this issue of Spider-Man was for me: faith-renewing. Thank you, Mr. Gage. Captain America and the First Thirteen #1 (One-Shot) – I’ve been waiting for this one-shot for months, not realizing it had come out in March. Woops. Well, I guess I don’t mind the wait, because it wound up being pretty good. 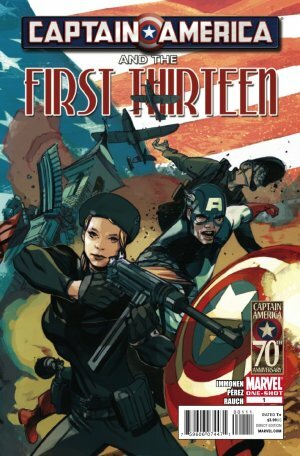 The ingredients are all there—Cap, Peggy Carter, wonderful artwork, and Kathryn Immonen doing the writing? That’s a win. We get a backstory here set during Cap’s time with the Resistance. It’s one of those stories that, although arguably “unessential” for our knowledge of the continuity, still adds a unique layer to the characters and their relationship that the reader may not have gotten otherwise. There’s war, drama, strong women, humor, and smart lines left and right. Some might call it a “throw away;” I call it an entertaining read that gets me even more excited for the upcoming Cap movie. Ch-check it out! X-Men: Legacy #248 – This is THE X-Men title to read. The rest is toilet paper. X-Men: Prelude to Schism #1 & 2 – Ummm … what? What the hell is this junk? Oh my God. Aforementioned faith is once again destroyed. I quit comics … (for the third time this week). Okay, seriously—this is such an utterly pointless mini. Issue two was a carbon copy of issue one, and neither part bothers to accomplish anything aside from attempting to illustrate Cyclops as some sort of savior to mutantkind. I say “attempting to” because what it ACTUALLY accomplishes is just a bunch of whining. This is two issues worth of Cyclops trying to make a decision—a decision on what, you ask? We don’t know! You aren’t going to be told, dear reader—and the best part is we have still another two issues left to go. Don’t waste your time with this. If you’re looking for a worthwhile X-book event to read, go back and pick up Mike Carey’s Age of X storyline in X-Men: Legacy. You need Prelude to Schism the way you need syphilis. This entry was posted on 05/21/2011 by ravenhaired. It was filed under Comic books, Female Characters / Creators, Reviews and was tagged with Batgirl, Birds of Prey, Bryan Q. Miller, Captain America, Christos Gage, DC, Dustin Nguyen, Fear Itself, Gail Simone, Jesus Saiz, Kathryn Immonen, Marvel, Mike Carey, Paul Jenkins, Spider-Man, X-Men. 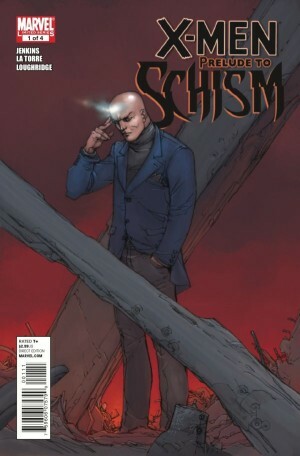 But Prelude to Schism is going to have that bitchin xmen logo poster when you put all 4 issues together! I mean…come on….isn’t that awesome? *ahem* NO! I just love a series that essentially is 4 issues of Cyclops making up his mind on what he wants for breakfast. 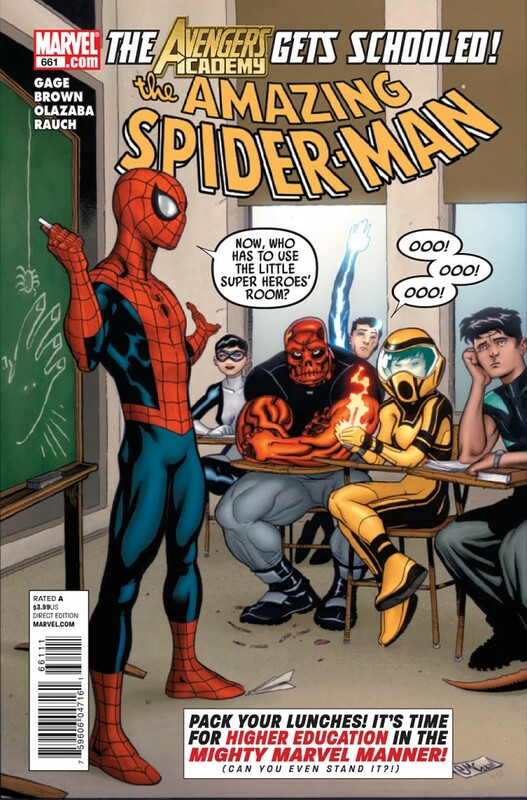 I wasn’t a fan of that issue of Spider-Man, but I think you’ll really like Avengers Academy. Interesting new characters, and some respect for Hank Pym. The recent prom issue is definitely a highlight. I guess I am jaded when it comes to Fraction because it seems like I’ve only read his subpar stuff, namely Uncanny X-Men. If I were to have read Casanova or any of the other things that’s gotten him all of the hype, maybe I’d be singing a different tune, but yeah–I’m just not a fan of what I’ve read so far. Fear Itself isn’t helping that, either. Meh….